Feeling almost as excited as if we were about to step on stage ourselves, we take out seats in the Robertson Theatre. Director Colin Anthes steps forward to thank us all for attending and gives a land acknowledgement. That calm, confident voice now so familiar from rehearsals is like a balm to the nerves we didn’t even know we had. At the beginning of this journey, we had no comprehension of just how invested we would become in the production’s success. We are so impressed by this talented group, there was never any need to worry that audiences wouldn’t enjoy The Team. 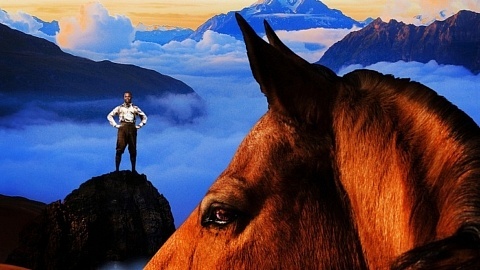 As can happen with live theatre, the audience of this particular performance is greeted by an unexpected development. With less than ten minutes left in the show, tensions are high between Alicia and Miranda. Before they can finish their dispute, the fire alarm goes off. The actors pause for a moment, then slowly looking at one another exit the stage. Anthes steps on stage and thanks us for our patience and jokingly states that this was a directorial choice and that he’s always wanted to make the fire alarm go off in one of his shows. 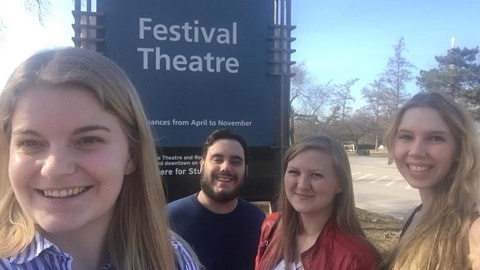 FirstOntario Performing Arts Centre staff ensure us it is stage one of the alarm and we do not have to evacuate. After a few minutes, the actors come back out and continue the scene. It is never easy to be forcibly stopped mid-performance. This scene, in particular, is emotionally intense; the climax of the piece. 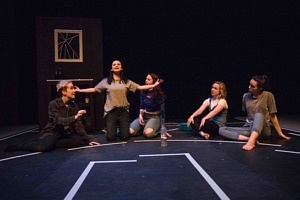 We already know from our previous experience in rehearsals that Kaitlin Race (Alicia) has struggled to find her emotional footing in this highly charged scene, particularly the righteously angry monologue she delivers towards the end of the party. She had previously asked, with some trepidation, if she was portraying the correct mix of emotions. Anthes had been confident that she was, and assistant director Michelle Mohammed offered to work with Race one on one to help her find the more grounded elements in what could easily become a hysterical rant. When the actors were able to continue the play, Race picked up the scene and continued with the same energy. We commend the cast, Race in particular, for taking this disruption in their stride. 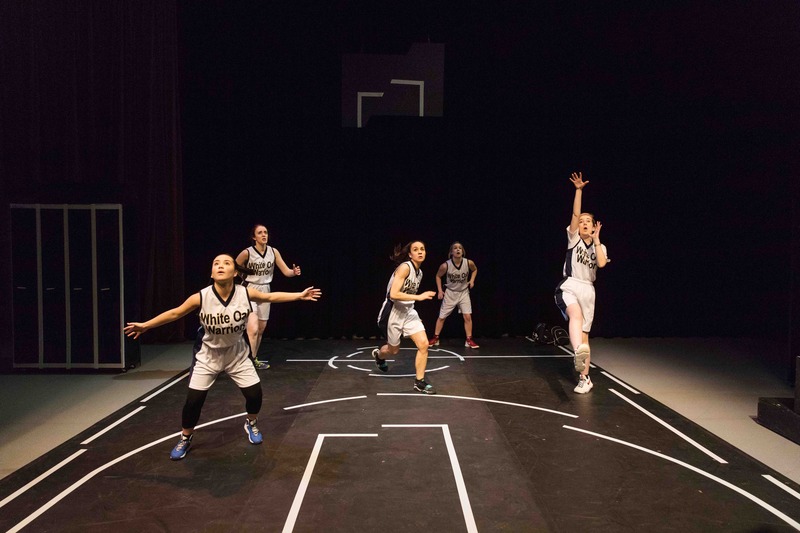 The work the actors have done with basketballs in rehearsal is put to the test, as they now have to mime along with precise sound effects, provided in real time by stage manager Jessica Campbell Maracle. The actors have to be exact with their movements—everything from dribbling to Miranda getting hit in the face. Although we had heard discussion of the use of audio to denote basketballs in rehearsal, we had never seen the idea put into practice. Seeing it live for the first time was very impressive and its seamless incorporation is a testament to the skill of the actors and technical team. 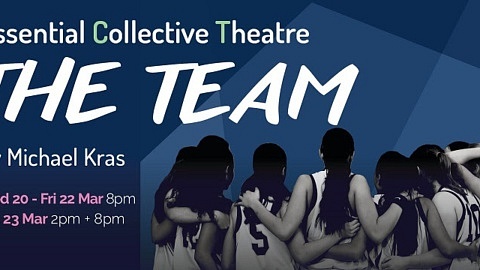 We are aware that The Team has also had an outing at Theatre Aquarius, a much smaller venue. Having seen The Team in the cavernous space of the Robertson, it would be interesting to see how a smaller venue affected this sense of scale and depth. The Robertson performance space is large, which gives the piece an expansive quality. The lighting is what elevates the piece, creating both a sense of grand proportions and intimacy when necessary. 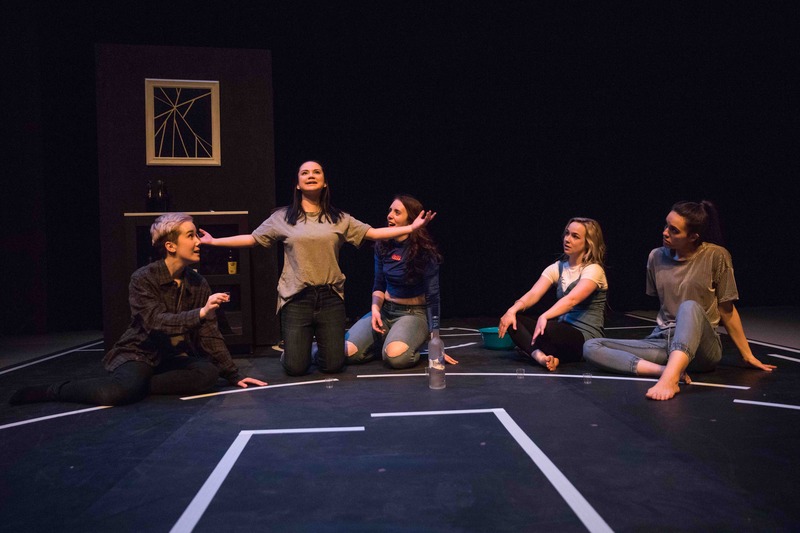 Designer James McCoy mentioned in our initial interview that he aimed to use lighting to create this sense of immense scale, something which he feels that indie theatre is generally lacking. He has certainly succeeded in this. Kaylyn Valdez-Scott, Laura Welch, Emily Lukasik, Kaitlin Race, and Lennon Bradford in The Team. Photo by Lauren Garbutt Photography. McCoy also uses lighting to guide the audience’s eye. In one particular moment, Bobbie is in the gym playing basketball while the rest of the team is in the cafeteria; blocking and lighting work together to ensure the stage does not feel crowded, and neither scene detracts from the other. In our earliest discussion, McCoy asserts, “we’re not cameras, we’re not television, we’re not film. Right? We don’t need to just be focused on this one square. We have a whole [stage] that we can play with.” It is clear by the way that Anthes and McCoy combine their skills to create this seamless effect that they are both dedicated to this concept. We see repeated examples of multiple conversations taking place at once, with skillful lighting and direction drawing the viewer’s eye to the most pertinent aspects of the action. Our time with The Team has come to an end. We are so grateful to Anthes and his team for allowing us into their process. It was a fascinating and rewarding experience; as novice embedders, we couldn’t have asked for a more accommodating and enthusiastic group.